Meet Our Beekeepers and Honey Vendors! 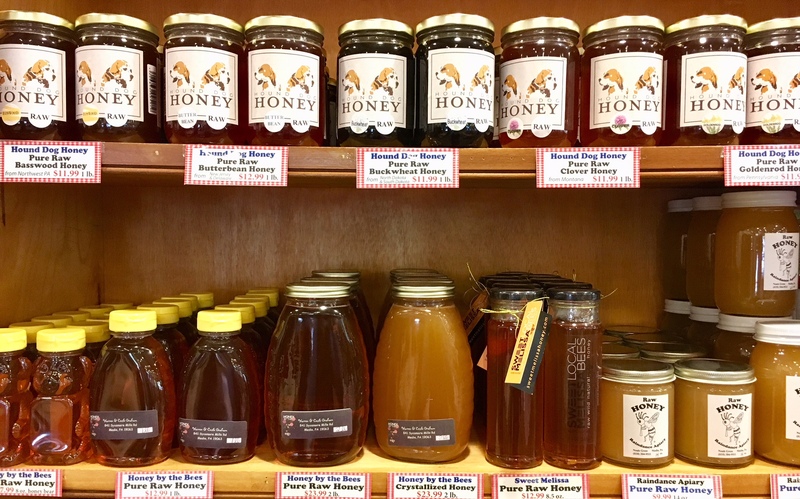 When you’re looking for honey at Wolff’s, you’ll notice that it comes from several different apiaries. But one thing all our honey has in common: it’s raw. Customers say that their seasonal allergies have gotten better after using raw honey. 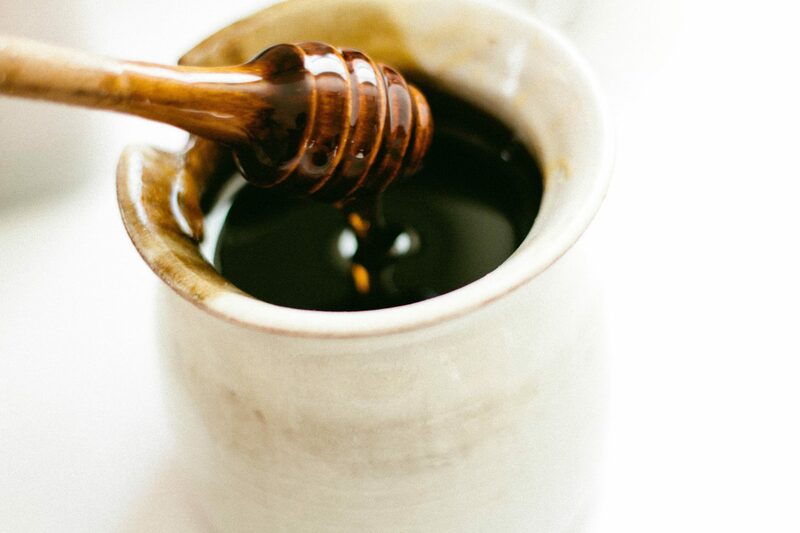 Since raw honey contains small amounts of local pollen, it can help people build up a tolerance for it. Noah Gress of Raindance Apiary explains that when honey isn’t raw, all the healthy pollen and propolis get filtered out. Raw honey is also a complete food source, says Noah. You could survive on raw honey alone because it has water, carbohydrates, protein, amino acids and some vitamins. All of these degrade when the honey is heated, but raw honey does not go through a heating process. First-time buyers of raw honey might notice it becoming solid more quickly. That’s okay, says Noah. Honey is most stable in its solid form. 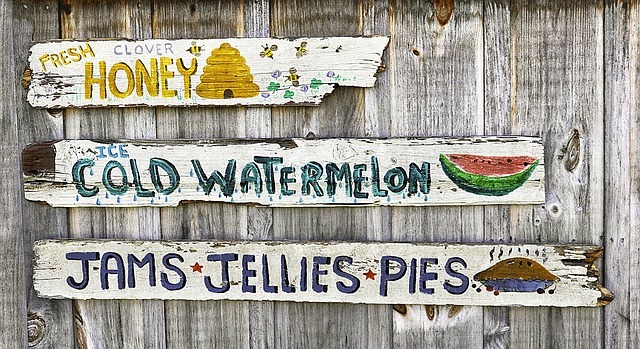 Now that you know a bit about raw honey, let’s meet the beekeepers and honey vendors! Warren Graham has the distinction of being a third generation beekeeper. His grandfather was a beekeeper, and his father became a famous Pennsylvania beekeeper. Having grown up around bees, Warren has fond memories of catching early swarms. He remembers salvaging feral bees from walls and trees. An 80-foot white oak tree near his house was the site of a treehouse and also a swing on the edge of a hill, where you could swing “way out over the void,” says Warren. It also had a hole with honeybees inside. He and his friends would slide “like little squirrels” right by the hive. During his childhood, Warren learned that bees are easy to get along with, but they do pick up on alarm pheromones. That’s why beekeepers use smoke, he told me. It covers up the smell. When it comes to using smoke, “there’s a real art to it,” says Warren. A cool smoke is ideal. Sometimes he uses only the soot, puffing an old smoker that hasn’t been lit. Though he was interested in bees as a child, he has been most deeply interested in bees since the 1970s. One thing he noticed during the decades since then is an increase in pests. In the 80s, tracheal mites killed Pennsylvania’s oldest honeybee populations, which have now been replaced with bees from different areas. Warren has remained in the area where he grew up. He lives in Ridley Creek State Park, within three or four miles of Wolff’s, and has his beehives there. That old white oak tree is on the park property. The tree died recently, but Warren hopes a section can be cut out of it so that kids can walk through the trunk and see how wide the tree was. It will tower above most of them! Like other local beekeepers, Noah collects honey from April to mid-June, during the “surplus nectar flow” when honeybees produce more than they need. 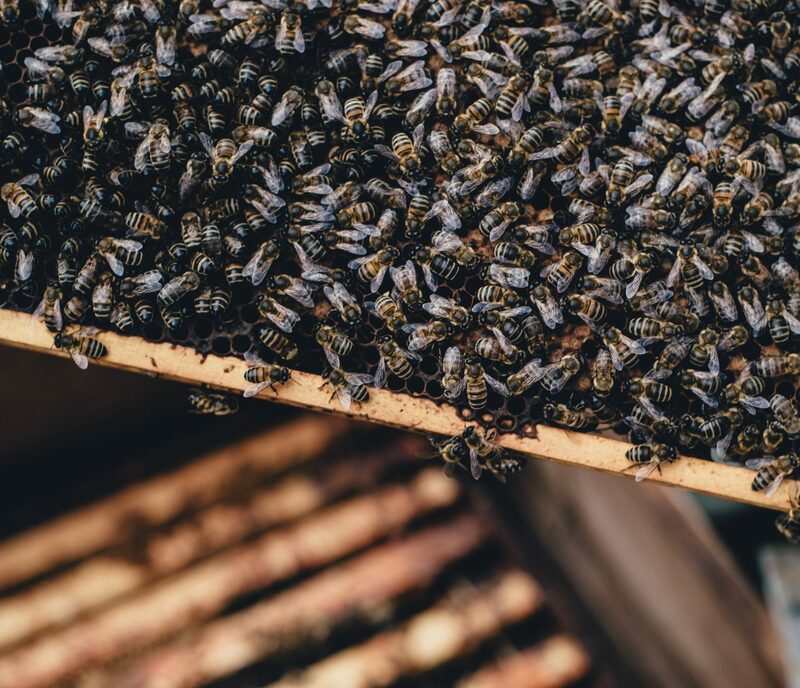 The rest of the year, beekeepers leave honey for the bees’ own use because that’s when they are storing up enough to make it through winter. We can help bees prepare for winter by making up for the “nectar dearth,” says Noah. Between mid-June and fall, bees don’t usually find as much nectar to collect. So, during mid-summer, be sure to plant blooms that help the bees. Flowering herbs and crepe myrtle work well, and herbs even have oils that help with hive health, he says. 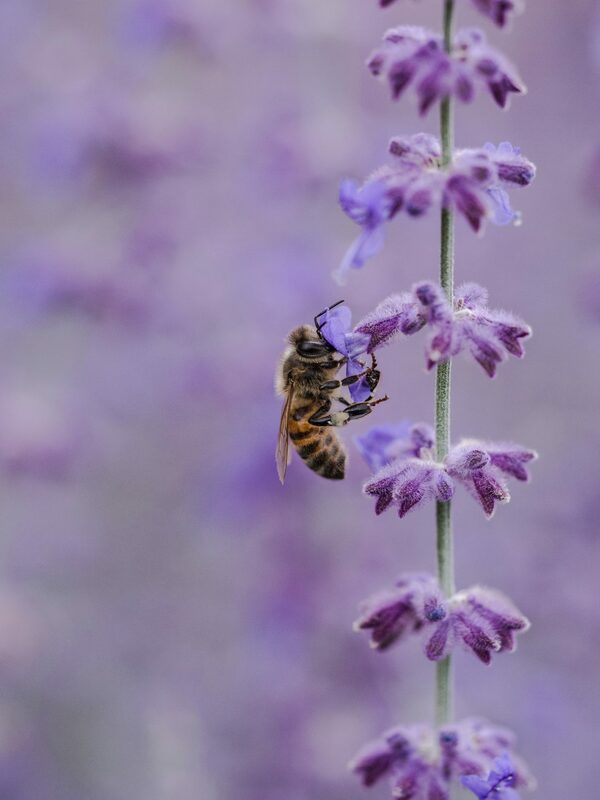 Hyssop, salvia, thyme and lemon verbeena are a few Noah named that bees especially love. (And we’d love to help you create a bee-friendly mid-summer garden!) Noah also advocates leaving the white clover in your yard. Bees love it and it blooms well into July. Buying local honey is another great way to support the bees. That way, you’re supporting the people who are caring for the honeybees that are right in your neighborhood–the people who have the knowledge to help this population thrive. Melissa Faddis started as an avid gardener who kept hearing about the hardships facing the honeybee population. She started doing research and signed up for an all-day beginners course with Chester County Beekeepers Association. There, she spent time in the field, with the hives. “It was the first time I had been inside a hive,” she says. She was fascinated. She also received a lot of mentoring from longtime beekeeper Warren Graham! She built hives and began selling honey from a “honey hut” in her front yard, about three miles away from Wolff’s. Eventually her son started working at Wolff’s, so Melissa looked into selling the honey here. A friend helped her develop her brand, and the hand-jarred honey appeared on the shelves of Wolff’s grocery section. Now in her eleventh year, Melissa still jars everything by hand. The operation is still small, which she prefers. And she’s still “nutty over bees,” she says. She now looks forward to each spring, when the bees first come out. “It makes the whole yard look alive,” she says. Wolff’s has recently added new raw honey to our offerings. 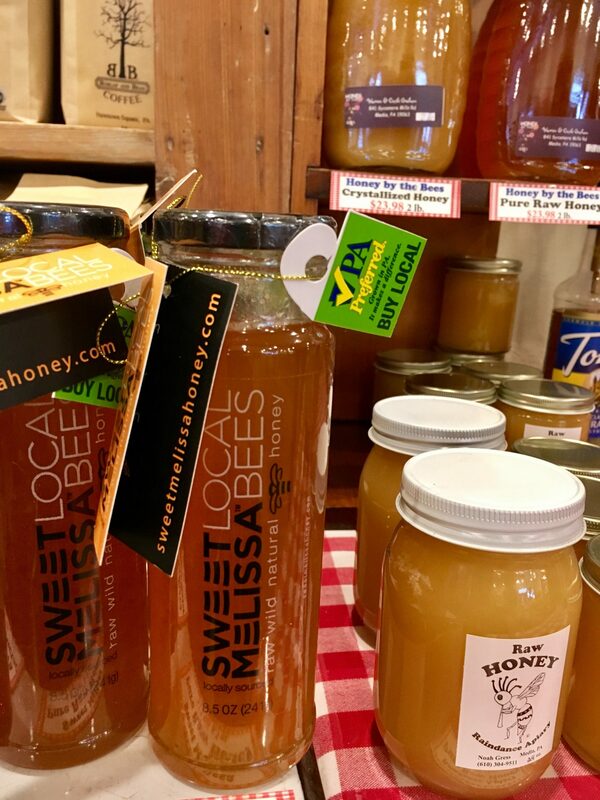 Hound Dog Honey from Glenmoore sources different types of honey from all over– some from Chester County beekeepers, plus clover honey from Montana bees, palmetto honey from Florida bees, and more. Their honey offers a great way to try new flavors while supporting a local business! Hound Dog is a new company that stems from another Chester County business with a long history in the area. Last year, Wes and his family purchased a longstanding Honey Brook honey business from Joe and Robin Miller. Wes had gotten to know them because of his habit of stopping to buy honey whenever he saw local honey signs outside of stores, and he particularly admired Joe and Robin’s business because of how many varieties they stocked. We are so thankful for the local beekeepers and honey vendors who bring us healthy raw honey! ← Reflections from Fran: What’s in a name?